Philip Ardagh is the bestselling author of the Eddie Dickens adventures. 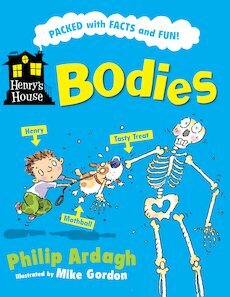 In 2009 he has two new series: the very funny fictional Grubtown Tales, and fact-packed Henry’s House. He wrote BBC radio’s first truly interactive radio drama, collaborated with Sir Paul McCartney on his first children’s book and is a ‘regularly irregular’ reviewer of children’s books for the Guardian. Married with a son, he divides his time between Tunbridge Wells and Grubtown, where he cultivates his impressive beard! Favourite children’s book as a child? Favourite children’s book for all ages? Favourite children’s book to read aloud? One of my own, Of course. On the radio, so I get paid. Favourite children’s book for a rainy day? Preferably one with a waterproof cover, non-running ink and a built-in umbrella. Which character from a children’s book are you most like? Mr Maggs in my own series Unlikely Exploits. 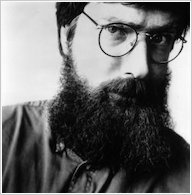 He and I have similar concerns, such as the letter ‘Q’ appearing too early on in the alphabet when it should be nearer the end with V,W,X,Y and Z. Oh, and Beardy Ardagh in my ‘Grubtown Tales’ because he is - almost - me. As an adult, I used only to be able to write in my study. Now I have a study and an office but I can write just about anywhere, so long as I have something to write with. And on. Where do you get inspiration for your books from? I lick the backs of certain toads. (I’m lying. I’ve never knowingly licked a toad in my life.) My head is full off stuff. Writing is simply getting that stuff out and into some kind of shape so that I can share it with others. My proudest (professional) moment was being elected pope, even though I’m not even a Catholic. Sadly, it turned out to be a dream. Ringing my sister to tell her that I’d been elected pope then, halfway through the call, realising that not only was the whole pope thing a dream, but that I don’t have a sister either. Embarrassing or what? A boy of above-average height. What was your least favourite subject at school? Maths and French, or French and Maths. I have nothing against mathematical French people, it’s just that my brain isn’t wired for those subjects or, maybe, the method used to (try to) teach me them to me. An imaginary tapier called Gilbert, not that he ever answers to his name. I don’t think he even loves me. The last time I checked, I was an animal: a hairy mammal of the homo sapiens sapiens variety. I think I still am. No thanks, I’ve already had one. It’s easier to say what food I don’t like: shellfish. Nothing personal. I mean as food. They could have great personalities. I’m not big on biscuits. Some have let me down in the past when I’ve tried dunking them in a hot beverage, so I’ve moved on. Favourites include: The Great Muppet Caper, the original 1933 King Kong, and ones with Cary Grant in them (the black and white ones). Which of the following totally rules? Home and Away or Neighbours? I don’t watch either but if I had to watch one it would be Corrie. The trailers for _ EastEnders_ always seem so dreary, with people with heads like potatoes trying to ‘sort out’ other mouthy people (and one or the other of them falling down some steps). X-Factor or Strictly Come Dancing? Richard and Judy or Fern and Phil? Ketchup for chips, mayonnaise for most other things including swimming and Christmas cards. DISCLAIMER: Philip Ardagh has insisted that we make it clear that, on other occasions, he might give completely different answers to one or all of these questions, so these particular answers should be treated with contempt, as one might a worthless guttersnipe or herring trying to play on your sympathies (or on your shins with tiny little drumsticks).